Web-based technological innovations are increasingly being utilized to enhance the quality of healthcare. The UCLA Behavioral Health Checkup™ (BHC) is an innovative real-time, cloud-based behavioral health assessment and clinician decision making tool. This paper examines the implementation and acceptability of the BHC within the UCLA Health System. The BHC was successfully integrated into seven UCLA Behavioral Health Associates (BHA) behavioral health collaborative care settings. Components of successful integration included training of administrative and clinical staff in use of the BHC platform, including how best to introduce behavioral health screening and measurement to patients and caregivers. BHA adult patients and caregivers of BHA youth patients reported positive experiences with the BHC. As the BHC delivers results to providers in real-time, it provides a unique occasion to engage patients through immediate discussion of patient responses and to use results for guiding and customizing clinical care. In addition, the integration of BHC results into a primary care system’s health record framework facilitates the coordination of care over time, providing an opportunity for measurement based treatment to target and treatment quality improvement. Keywords: Behavioral health, technology, assessment, screening, collaborative care. The Triple Aim, set forth in the Patient Protection and Affordable Care Act of 2010, seeks to improve the health of the United States population while increasing the quality of care provided and containing healthcare costs.1 In response to this charge, health systems are increasingly adopting new strategies to increase quality and accountability in healthcare. Web-based technological innovations may be utilized to enhance care provided to patients through screening, assessment, and tracking of health outcomes,2 and guiding clinician feedback to patients.3 This paper examines the integration process and acceptability of the UCLA Behavioral Health Checkup (BHC), an innovative real-time, cloud-based behavioral health assessment and clinician decision making tool, within seven behavioral health collaborative care settings within UCLA Health system. The BHC collects self-report data from patients (adults and youth) and caregiver report data for youth (≤ 17 years) and provides real-time clinician guidance and a patient registry for clinical monitoring. The BHC assessments consist of psychometrically validated measures that are free and available within the public domain, such as the Patient Health Questionnaire (PHQ-9).7 Measures were chosen to provide clinical information about common behavioral health symptoms, while considering the length of time required to complete assessments. The selected assessments can be comfortably completed within 15 minutes. See Table 1 for a summary of measures. Youth-Completed Assessments: Youth between 7 and 17 years of age completed age-specific behavioral health assessments, such as the Strengths and Difficulties Questionnaire (SDQ)-Youth Version,8,9 PHQ-9,7 Short Form-Moods and Feelings Questionnaire (MFQ-SF),10 Screen for Child Anxiety Related Disorders (SCARED),11 and CRAFFT Screening Test.12 CRAFFT stands for the key words in this screening test for high risk alcohol and other drug use (Car, Relax, Alone, Forget, Friends, Trouble). Caregiver-Completed Assessments: Caregivers of BHA patients completed the SDQ parent version, McMaster Family Assessment Device (FAD)13 General Functioning scale, and SNAP-IV.14 At 3-month follow-up, caregivers completed an 8-item survey querying their experience using the BHC. Adult-Completed Assessments: BHA adult patients completed the Alcohol Use Disorders Identification Test (AUDIT-C),15 PHQ-9,7 General Anxiety Disorder scale (GAD-7),16 and Primary Care PTSD Screen (PC-PTSD).17 If the adult scored positive on the PC-PTSD, the screening tool gated the patient to receive the PTSD Checklist (PCL).18 Patients also completed a one-item substance use screener asking “How many times in the past year have you used an illegal drug or used a prescription medication for non-medical reasons?” This question has a sensitivity of 92.9% and specificity of 94.1% for self-reported current drug use.19 Patients who screened positive by indicating one or more times on this screening question were gated to the Drug Abuse Screening Test 10-item (DAST-10).20 At 3-month follow-up, adult patients completed an 8-item survey querying their experience using the BHC. The BHC has been integrated with UCLA Health System’s EHR, Epic. All BHC assessments are launched through Epic and are completed by the patient/caregiver on a tablet in the clinic waiting room prior to a behavioral health intake appointment and again at 3-month increments up to their 12-month appointment. Following completion of assessments, BHA providers immediately receive their patient’s results via the EHR, and reports are sent to their secured email. If a patient indicates he or she is experiencing suicidal ideation on the PHQ-9, a separate email alert is sent to the provider and the clinic manager to flag this patient’s result. Since the BHC is completed at point of service within the clinic, this ensures the email alert is read promptly by the clinician. The email reports provide clinicians with interpretation of results and empirically supported guidance in addressing with the patient their protective and risk factors ascertained in the assessment. The clinical guidance tool was developed using standardized cut-offs for psychometrically validated measures to identify the continuum of risk. Clinical feedback language was developed for each of the risk ranges for each measure to guide patient psychoeducation on coping and cognitive behavioral skills. For instance, a BHC assessment resulting in a PHQ-9 score of 15-19 (moderately severe depression)7 will generate feedback to the clinician that the patient is likely experiencing emotional and functional symptoms of depression. The feedback encourages the provider to use emotional regulation and cognitive restructuring tools to support the patient and to continue to monitor and consider referral for behavioral health treatment. The BHC tool was developed by the UCLA Semel Institute within Salesforce, a third-party industry-leading database and customer relationship management system. Salesforce signed a HIPAA Business Associates Agreement with UCLA Health system, which ensures the data housed within Salesforce is encrypted, secure, and follows UCLA Health policy. Assessment results are stored within the EHR notes tab. The availability of results within the EHR allows for collaboration of care amongst providers. This research protocol was submitted to the UCLA Institutional Review Board, and their determination was that this work did not involve human subjects research and therefore did not require full review. Twenty-one behavioral health clinicians were trained to utilize the BHC assessment results and clinical guidance with their patients. The clinicians were encouraged to utilize summary scores and results to guide their clinical care and monitor their patient’s improvement over time. After some experience with the BHC reports, the clinicians provided feedback to BHA leadership regarding usability of reports. Through an iterative process, reports were enhanced to include specific details such as itemized questions and elevated responses endorsed by a patient. Utilizing the BHC data management capabilities, BHA leadership receive monthly data summaries which alert them to patients who have not shown clinically significant improvement since beginning treatment.5 This allowed providers to intervene at an individual patient level and adjust treatment methods or to implement additional training at the provider and/or clinic level. From March 7, 2014 to July 31, 2017, 3,884 adult patients, 798 youth patients, and 898 caregivers of patients completed BHC baseline assessments. All BHC assessments were administered to BHA patients as part of routine care within the collaborative care model. Patient experience with the BHC was assessed at 3-month follow-up appointments using six rating scale items and two qualitative feedback items adapted from existing satisfaction and acceptability questionnaires utilized in various service delivery projects at the center. Frequencies of each response option for the six rating scale patient experience items were determined. See Tables 2 and 3 for full item text and distribution of responses. The patient experience items were administered to adult patients and the caregivers of pediatric patients within the BHC platform at 3-month follow-up appointments. Three-month follow-up data are available for 114 caregivers and 667 adult patients. Relative to the number of completed baseline assessments, the number of 3-month follow-up assessments is small because some patients either: (1) concluded treatment prior to the 3-month follow-up interval, (2) did not attend a visit during the 3-month interval, or (3) completed a baseline less than three months prior to the end of data collection (July 31, 2017). Among the 114 caregivers and 667 adults who completed the BHC at 3-month follow-up, 79 caregivers and 553 adult patients provided responses for the patient experience items (81% response rate). Among the 553 adult patients, 65% were female and the mean age was 43.5 years (ranging from 18 to 82 years). Gender and age was not collected for caregivers. 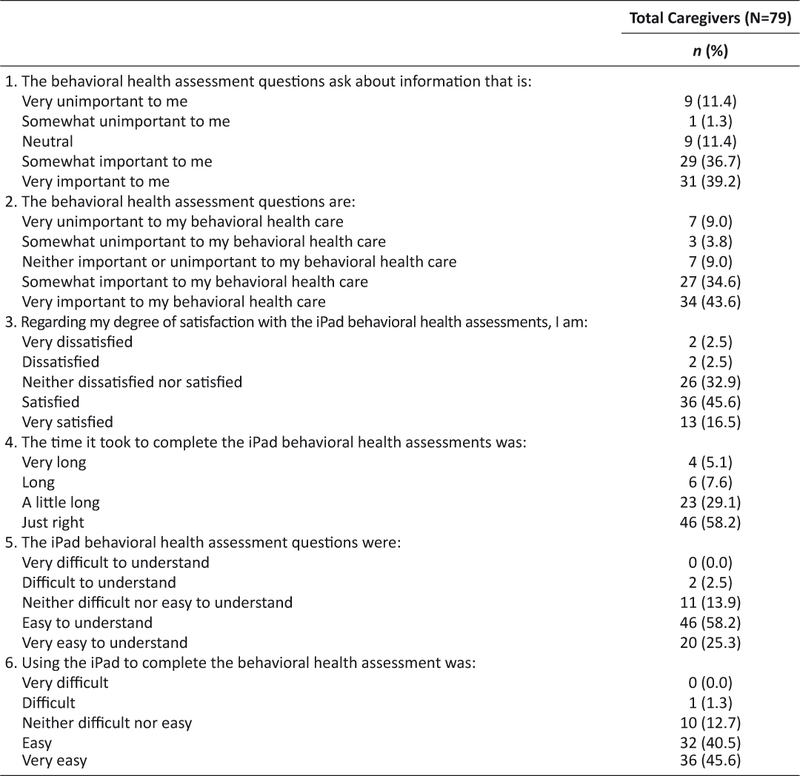 Of the 79 caregivers who responded to the patient experience items, 78.2% felt the questions themselves were “very” or “somewhat important” to them, 62.1% were “very satisfied” or “satisfied” with the assessments, 58.2% felt the time it took to complete the assessments was “just right”, 83.5% thought the questions were “very easy” or “easy” to understand, and 86.1% felt that using the tablet to complete the questionnaires was “very easy” or “easy”. See Table 2 for full results. 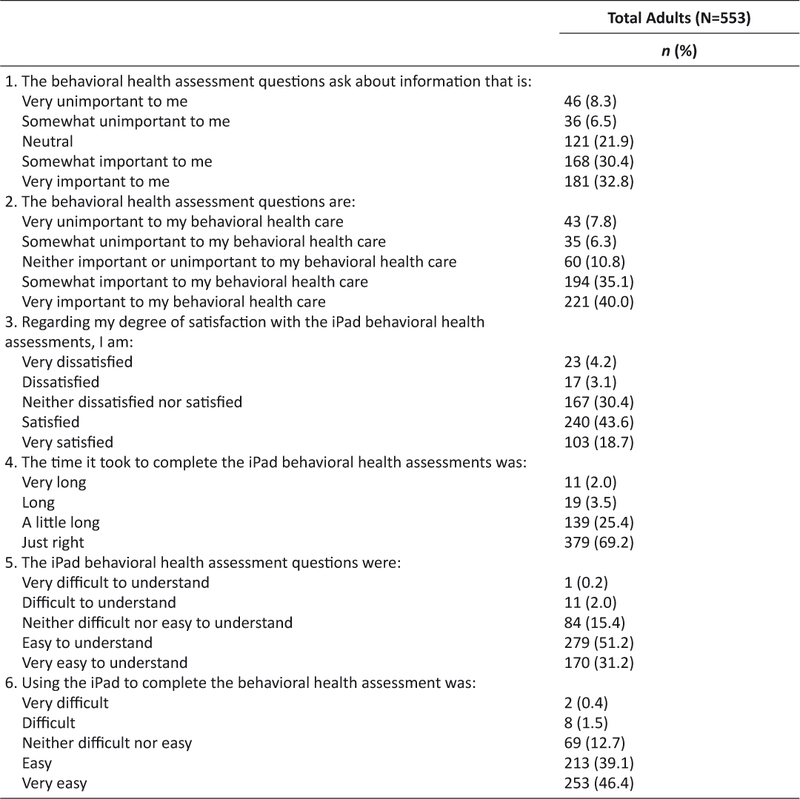 Of the 553 adult patients who responded to the patient experience items, 75.1% felt the questions themselves were “very” or “somewhat important” to them, 62.3% were “very satisfied” or “satisfied” with the assessments, 69.2% felt the time it took to complete the assessments was “just right”, 82.4% thought the questions were “very easy” or “easy” to understand, and 85.5% felt that using the tablet to complete the questionnaires was “very easy” or “easy”. See Table 3 for full results. An important component of the health of a population is its behavioral health status. Despite the usefulness of traditional behavioral health assessments, they are often experienced as cumbersome to use in real-time within a busy clinic setting, given time requirements for scoring, interpretation of results, and patient data entry burden.22 The BHC tool, powered by a cloud-based technology, has provided an opportunity to personalize and standardize patient care by providing customized clinical guidance based on real-time patient results. This information is automatically transmitted into UCLA’s EHR for coordination of care over time, providing an opportunity for measurement based treatment to target and treatment quality improvement. The BHC was successfully integrated into a collaborative care setting within UCLA Health System. Components of successful integration included training of administrative and clinical staff in use of the BHC, including how best to introduce behavioral health screening and measurement upon appointment check-in. An important aspect of the training included attentiveness to the cultural shift required for BHA administrative staff to gain confidence with discussing the purpose of behavioral health assessment with patients. The selection of specific psychometrically-validated questionnaires was conducted in collaboration with BHA clinicians to maximize usefulness of the BHC for the patient population. Through an iterative process, BHA clinicians guided the structure of assessment reports. Integration with the EHR optimized workflow and allowed for ease of examination of results by multiple providers involved with a patient’s care. When behavioral health assessment results are available to providers in real-time, they provide a unique occasion to engage patients through immediate discussion of patient responses and use of results to guide clinical care. BHA adult patients and caregivers of BHA youth patients reported positive experiences with the BHC. Use of the BHC increased the patient-centeredness of care. The BHC is also utilized to monitor patient progress in treatment in order to assess treatment to target outcomes. This quality of care monitoring is an essential component of collaborative care and is essential for organizations engaging in value-based care contracts. Limitations of this paper include potential generalizability of results, as the BHC was implemented within a large academic institution with a well-developed behavioral health collaborative care program. Additionally, we cannot exclude the possibility that a sampling bias may be present. Individuals completing the patient experience items at 3-month represent those who are still in care, or whose children are still in care, at BHA. These individuals may be more motivated to participate in treatment. Future papers will expand on use of the BHC for measurement based treatment to target and clinical outcomes monitoring. The UCLA BHC was successfully integrated into a behavioral health collaborative care setting within UCLA Health System. Adult patients and the caregivers of youth BHA patients indicated having a positive experience with the platform. These findings affirm that web-based technology platforms are well suited to aid in achieving the goals of enhancing patient care. 1. Berwick DM, Nolan TW, Whittington J. The triple aim: care, health, and cost. Health Aff (Millwood) 2008;27(3):759–69. doi: 10.1377/hlthaff.27.3.759. 2. Jensen RE, Rothrock NE, DeWitt EM, et al. The Role of Technical Advances in the Adoption and Integration of Patient-Reported Outcomes in Clinical Care. Medical care 2015;53(2):153–9. 3. Beardslee WR, Lester P, Klosinski L, et al. Family-centered preventive intervention for military families: Implications for implementation science. Prev Sci 2011;12(4):339–48. 4. Unutzer J, Ratzliff A. Evidence-base and core principles. In Raney L, ed. Integrated care: working at the interface of primary care and behavioral health. Washington, DC: American Psychiatric Publishing 2015:3–16. 5. Clarke RM, Jeffrey J, Grossman M, et al. Delivering on accountable care: lessons from a behavioral health program to improve access and outcomes. Health Affairs 2016;35(8):1487–93. 6. Beardslee WR, Klosinski LE, Saltzman W, et al. Dissemination of family-centered prevention for military and veteran families: adaptations and adoption within community and military systems of care. Clin Child Fam Psychol Rev 2013;16(4):394–409. doi: 10.1007/s10567-013-0154-y. 7. Kroenke K, Spitzer RL, Williams JB. The PHQ-9: validity of a brief depression severity measure. J Gen Intern Med 2001;16(9):606–13. 8. Goodman R. The Strengths and Difficulties Questionnaire: A Research Note. J Child Psychol Psychiatry 1997;38:581–86. 9. Bourdon KH, Goodman R, Rae DS, et al. The Strengths and Difficulties Questionnaire: US normative data and psychometric properties. J Am Acad Child Adolesc Psychiatry 2005;44(6):557–64. 10. Angold A, Costello EJ, Messer SC, et al. The development of a short questionnaire for use in epidemiological studies of depression in children and adolescents. Int J Methods Psychiatr Res 1995;5:237–49. 11. Birmaher B, Brent DA, Chiappetta L, et al. Psychometric properties of the Screen for Child Anxiety Related Emotional Disorders (SCARED): a replication study. J Am Acad Child Adolesc Psychiatry 1999;38(10):1230–6. 12. Knight JR, Sherritt L, Shrier LA, et al. Validity of the CRAFFT substance abuse screening test among adolescent clinic patients. Arch Pediatr Adolesc Med 2002;156(6):607–14. 13. Epstein NB, Baldwin LM, Bishop DS. The McMaster family assessment device. J Marital Fam Ther 1983;9(2):171–80. 15. Bush K, Kivlahan DR, McDonell MB, et al. The AUDIT Alcohol Consumption Questions (AUDIT-C): An effective brief screening test for problem drinking. Arch Intern Med 1998;3:1789–95. 16. Spitzer RL, Kroenke K, Williams JBW, et al. A brief measure for assessing generalized anxiety disorder: the GAD-7. Arch Intern Med 2006;166:1092–1097. 17. Prins A, Ouimette P, Kimerling R, et al. The primary care PTSD screen (PC-PTSD): development and operating characteristics. Primary Care Psychiatry 2003;9:9–14. 19. Smith PC, Schmidt SM, Allensworth-Davies D, et al. A single-question screening test for drug use in primary care. Arch Intern Med 2010;170(13):1155–60. doi: 10.1001/archinternmed.2010.140. 20. Yudko E, Lozhkina O, Fouts A. A comprehensive review of the psychometric properties of the Drug Abuse Screening Test. J Subst Abuse Treat 2007;32(2):189–98. 21. Raney L, Lasky G, Scorr C. The Collaborative Care Team in Action. In Raney L, ed. Integrated care: working at the interface of primary care and behavioral health. Washington, DC: American Psychiatric Publishing 2015:17–41. 22. Stevens J, Kelleher KJ, Gardner W, et al. Trial of computerized screening for adolescent behavioral concerns. Pediatrics 2008;121(6):1099–105. doi: 10.1542/peds.2007-1878.